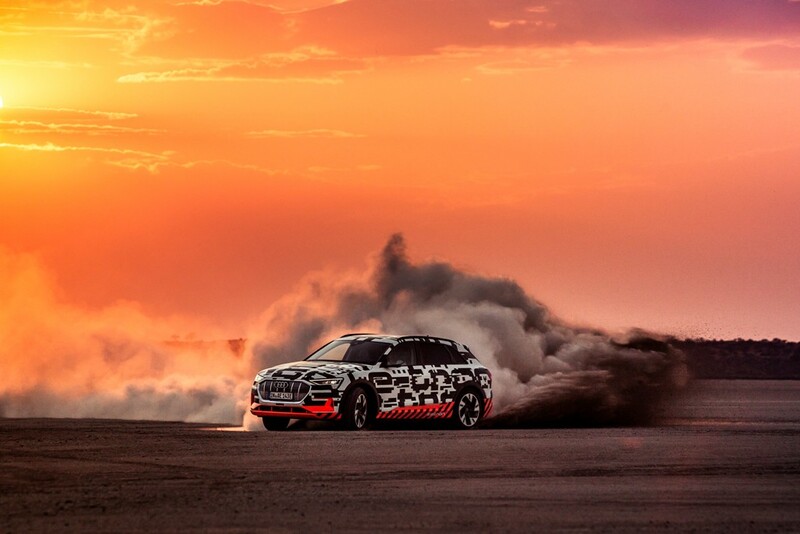 With driving dynamics tests on Namibia’s salt flats and savanna, the Audi e-tron prototype is at present impressively demonstrating its handling qualities. All made possible thanks to a new generation of the quattro drive – the electric all-wheel drive. In conjunction with the versatile suspension, its low centre of gravity and the powerful electric motors, the electric SUV offers powerful traction, outstanding dynamics and unshakable stability on disparate terrain. The dried-out salt lake on the edge of the Kalahari Desert measures 2 by 2.3 kilometres (1.2 by 1.4 mi). 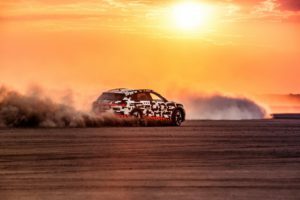 Its porous, hard surface with fine-grained gravel offers a low coefficient of friction – optimal conditions to experience the Audi e-tron prototype in a controlled drift and get a feel for its lightning-fast acceleration coupled with high traction. 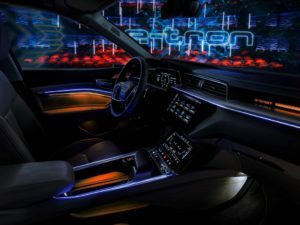 This is possible thanks to the electric all-wheel drive and numerous suspension systems that are intelligently interconnected, most notably the Electronic Stabilization Control (ESC), the Audi drive select dynamic handling system and the standard air suspension. 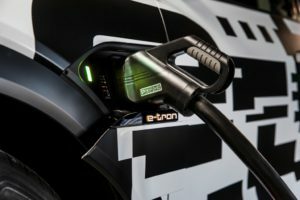 On rough terrain, it increases the ground clearance of the Audi e-tron prototype at the push of a button by 50 millimetres (2.0 in). At the same time, the ESC optimizes the traction and brake control. It also increases the effect of the electronic differential lock for optimum power transfer and propulsive power. As such, the electric SUV effortlessly takes even the sandy soil of the African savanna in its stride. The two electric motors provide the ideal power source for the high-precision, ultrafast electric quattro. In boost mode they provide up to 300 kW and a maximum 664 Nm (489.7 lb-ft) of torque. The effective thermal management plays a crucial role in their performance. It allows the performance to be reproduced even if the powertrain components are subjected to high loads. The result: outstanding dynamic handling and driving pleasure at all times. 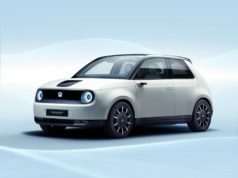 The electric quattro combines the efficiency of a single-axle drive with the driving dynamics and traction of an all-wheel drive. It ensures the continuous and variable regulation of the ideal distribution of drive torque between the two axles. The quattro also reaches a new level of variability, dynamics and precision. It takes just around 30 milliseconds from the system detecting the driving situation and the torque from the electric motors kicking in – much faster than with conventional quattro technology. The reason is that with the electric all-wheel drive a mechanical clutch is not engaged but electricity is simply distributed. And that takes just a fraction of a second. 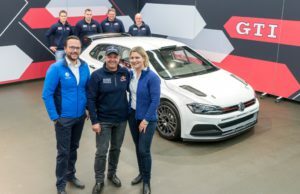 So even with sudden changes in the coefficients of friction and extreme driving situations, there’s a guarantee of the full quattro performance. 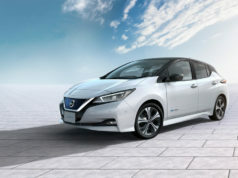 The key to the electric all-wheel drive is the intelligent networking of numerous control systems. The central suspension control unit integrates both the handling controller of the quattro drive and the wheel-selective torque control for the first time. If understeer is detected during sporty driving, it gently brakes the inside wheels, which are under a reduced load, thus directing the torque to the outside. The car turns into the curve and precisely follows the steering angle. Furthermore, an innovative traction control system provides for high traction and stability. The control over wheel slip is directly at the power electronics of the electric motors, 50 times faster than before and an even more precise match to the driving situation. For the driver, this is particularly noticeable in combination with the four-stage function modes of the Electronic Stabilization Control (ESC). 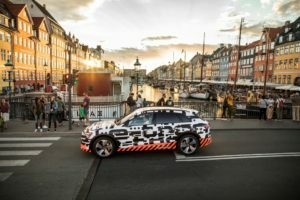 In addition to the ESC, the characteristics of the Audi e-tron prototype can also adapt to various types of terrain. That is possible by using the standard dynamic handling system. Whether relaxed cruising, dynamic cornering or excursions off the beaten track, the driver can choose between seven profiles. They depend on the driving situation, road conditions or personal requirements. Besides the drive system characteristic and steering boost, Audi drive select also influences the standard adaptive air suspension with controlled dampers. On the highway, the body is lowered by as much as 26 millimetres (1.0 in), which improves stability and the aerodynamics. Offroad it can lift the body by 50 millimetres (2.0 in). 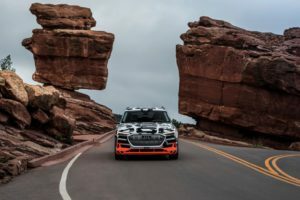 The low installation position of the powertrain components and the high-voltage battery makes a decisive contribution to the high transverse dynamics of the electric SUV. The battery system is located centrally beneath the passenger compartment. It is between the axles in the form of a flat, broad block. The centre of gravity of the Audi e-tron prototype is on a par with that of a sedan. Axle load distribution has a perfect balance of almost 50:50. 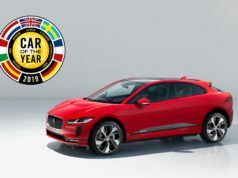 Compared to a conventional SUV, the all-electric model offers 45 per cent higher torsional rigidity, the basis for precise handling and acoustic comfort.